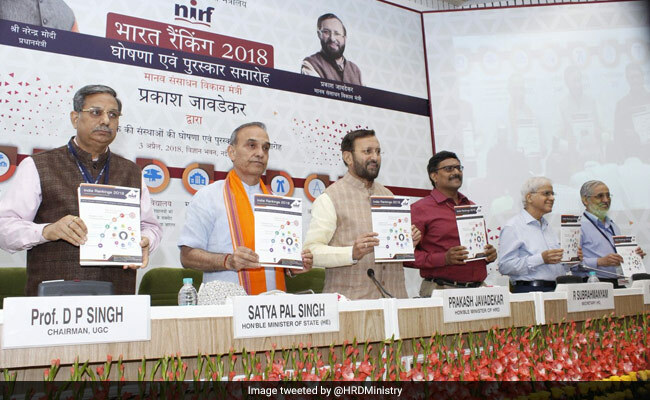 HRD Minister Prakash Javadekar releases NIRF India Rankings 2018 today. New Delhi: The National Institutional Ranking Framework (NIRF), 'India Rankings', India's own top university rankings under 9 different categories is being released by Human Resources Development (HRD) Minister Prakash Javadekar now. The NIRF Rankings 2018 will be released at 3.00 pm, Vigyan Bhawan, New Delhi. Indian Institute of Science (IISc) Bangalore and Indian Institute of Technology, Madras topped the NIRF ranking in overall category while IISc Bangalore and JNU topped the universities category and Miranda House ranked top in colleges' category. NIRF India Rankings 2018 will be released in these categories: Overall, Universities, Engineering, Colleges, Management, Pharmacy, Medical, Architecture, and Law. This year, NIRF authorities have added three more categories than last year's; Medical, Architecture and Law. April 3, 2018 04: 53 pm: HRD ministry congratulated the institutes for achieving the rankings. April 3, 2018 03:50 pm: Indian Institute of Technology, Kharagpur and Indian Institute of Technology, Roorkee and School of Planning and Architecture are top architecture colleges in India, according to NIRF 2018. April 3, 2018 03:20 pm: This year weightage for graduation outcome has increased. Earnings from patent and ITR has been left out this year. First time pre-registration for colleges and institutes (for institutes which had participated earlier and for which information was available). April 3, 2018 03:13 pm: The participation for public funded institutes is made mandatory from next year. April 3, 2018 03:12 pm: An official says the more educational institutes have participated this year and have greater participation in every categories. April 3, 2018 02:10 pm: Medical, Law and Architecture institutes to be ranked for the first time. The institute registration for NIRF Ranking 2018 was began on the official website for NIRF in September 2017. The practice of ranking Indian institutes by MHRD was approved in 2015 and the first rankings were released in 2016 followed by the second time ranking in 2017. For institutions to be ranked, institutes including universities and colleges need to submit their details on the registration portal which has been activated on the official NIRF website. The last date to register was October 6, 2017.